With my parents move into my house came many things — two more bodies, two more cats, a lot more stuff and a new presence in the kitchen. While I mostly handle the household chores (cooking, cleaning, laundry, etc), my mom does make an occasional dinner. It’s usually a “childhood favorite”, a meal I grew up on but just never bothered to make myself. 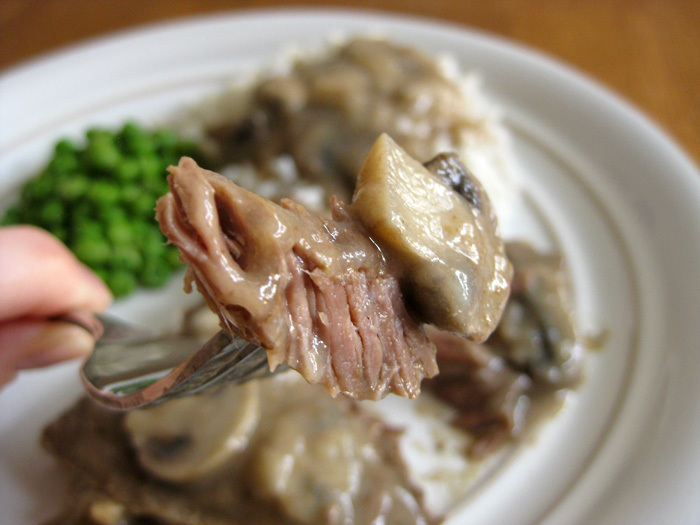 Today, I bring you one such meal, one we creatively call Meat & Mushrooms. If you are a regular follower of my recipe posts, you may have caught on that I am not a beef eater. There are two occasions when I eat it, and this is one. 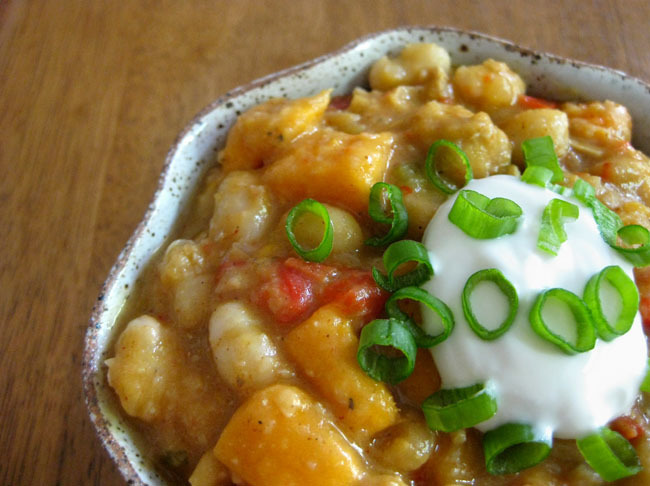 This meal is the epitome of simple, hearty goodness. Beef, onions, mushrooms — that’s about it. It feels like it was transported from my grandma’s kitchen in 1960 and dropped onto my counter. 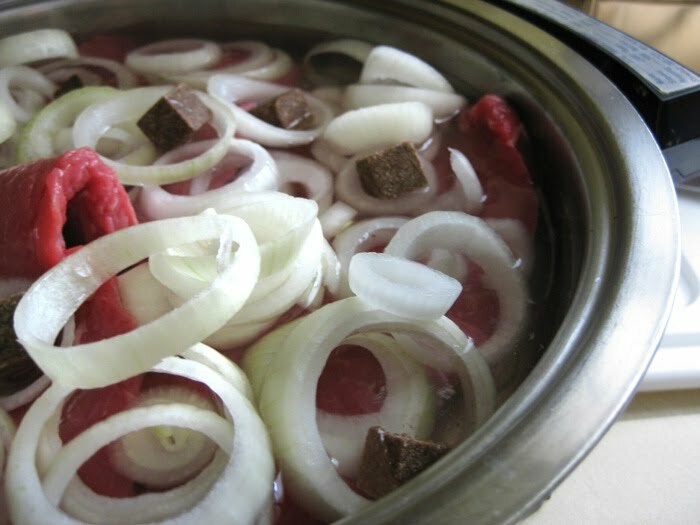 In an electric skillet (we swear by a 30 year old Lifetime brand one), place the raw beef, sliced onion, bouillon cubes and one bay leaf (if desired). 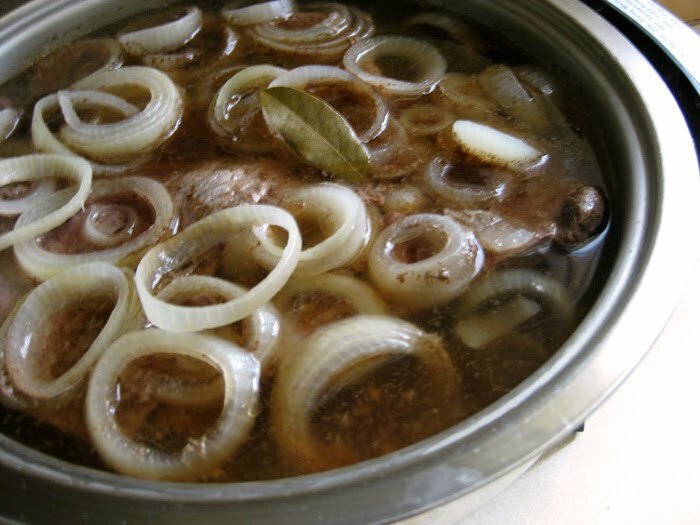 Add enough water to just cover the meat and simmer, covered, for about 4 – 5 hours or until the meat is cooked to your liking. By the way, don’t be scared of the onions if you’re usually not a fan. They cook away into nothing but flavor which isn’t oniony and gross, but essential and delicious! Beware, this dish will make your house smell amazing all day, therefore making you really, really hungry and possibly driving your dog (and maybe your husband) crazy. 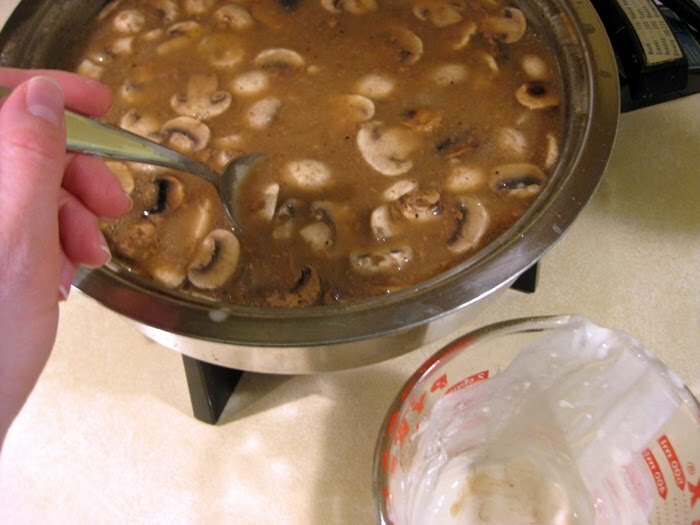 Once the meat is done, add the mushrooms and continue simmering until the mushrooms reach your desired tenderness. Add the meat back to the pan to heat up and you’re ready to eat! 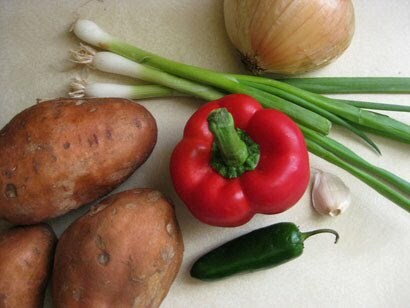 We prefer to serve this over rice with some veggies, but it’s delicious with mashed potatoes, too. 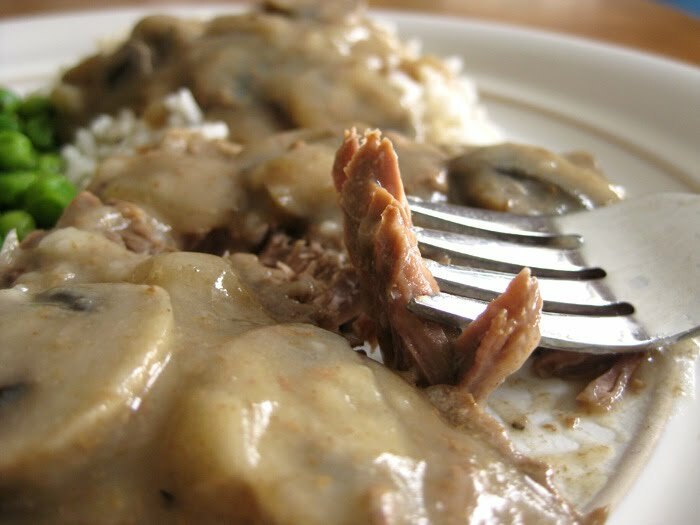 The gravy is so good you’ll want to keep any leftovers to spoon in your morning coffee, err… well, you get it. If I could eat only one dessert for the rest of my life, anything involving peanut butter and chocolate would win hands down, but this cheesecake would be a close second. There’s just something about lemon that I find irresistible no matter what the form. 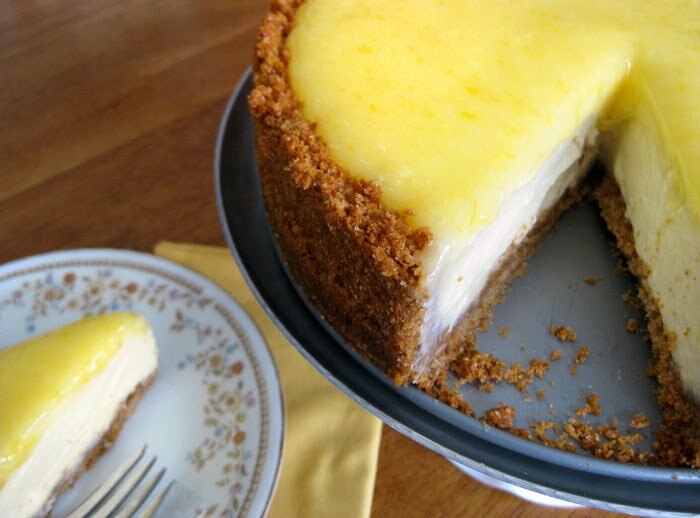 This creamy, lemon-flavored cheesecake is topped with a homemade lemon curd glaze that is truly just too delicious for me to express, especially considering it requires only seven basic ingredients and is quick and easy to make. *You will need a total of 3-4 medium to large lemons. Zest all the lemons before squeezing. 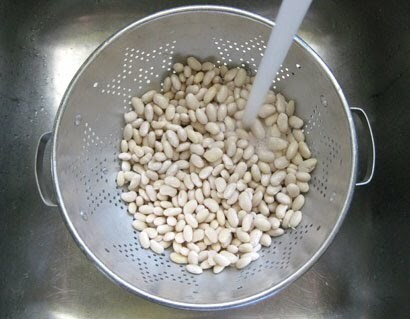 Combine the crust ingredients in a medium bowl and press onto the bottom and 2″ up the sides of a 9″ springform pan. Set the pan on a baking sheet and bake at 350° for 10 minutes. Let sit on a wire rack while you prepare the filling. Keep the oven at 350°. For the filling, in a large bowl, beat cream cheese and sugar until smooth. Add eggs and beat on low until combined. Stir in the lemon juice, lemon peel and vanilla until just blended. Pour slowly into crust, return pan to baking sheet and bake for 40 – 45 minutes or until edges are set and center is almost set. Cool on a wire rack for 10 minutes. Carefully run a knife around the edge of the pan to loosen the crust, cool for another hour then refrigerate overnight before serving. For the glaze, in a small heavy saucepan, whisk the eggs, sugar, lemon juice and peel until blended. Add butter and cook, whisking constantly, until mixture thickens and coats the back of a spoon. Transfer to a small bowl and cool for 10 minutes. Cover and refrigerate until chilled. 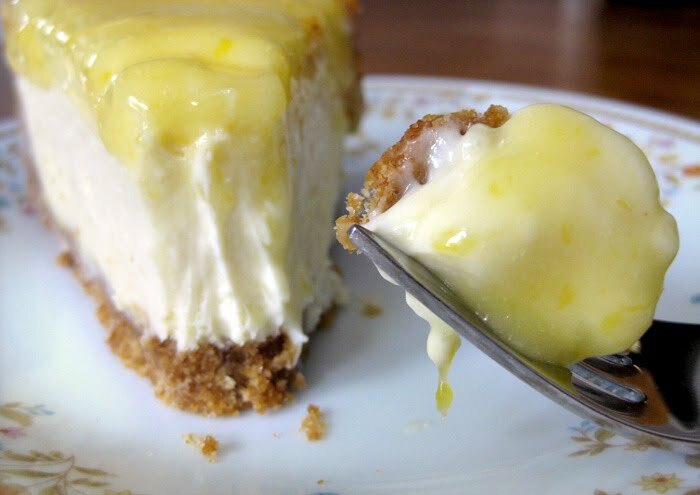 Spread glaze on cheesecake before serving or serve it on the side with slices – yum! 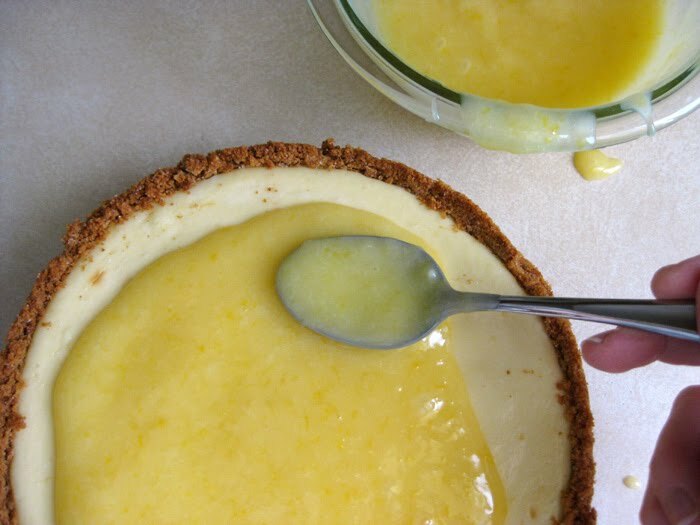 You will have about twice as much curd as you need to glaze the cheesecake but if you don’t just eat it with a spoon (trust me, you will want to), it’s delicious on toast, biscuits, scones, ice cream and sugar cookies! 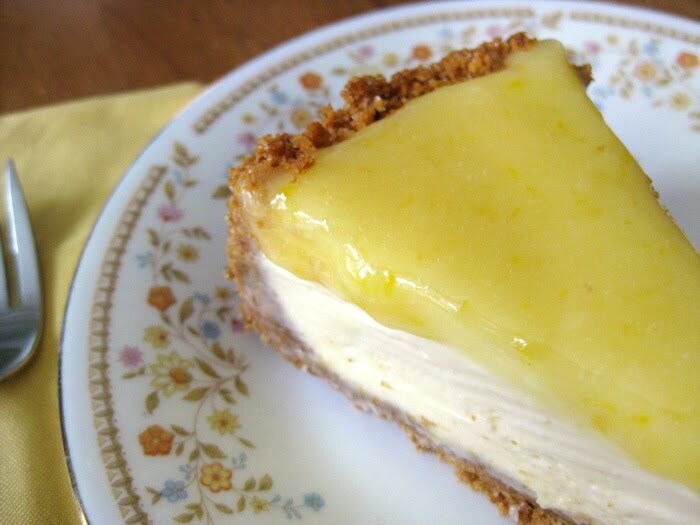 This dessert is rich and decadent but still feels and tastes light and refreshing because of the lemon making it the perfect ending to a heavy holiday meal or a backyard BBQ on a hot summer day. 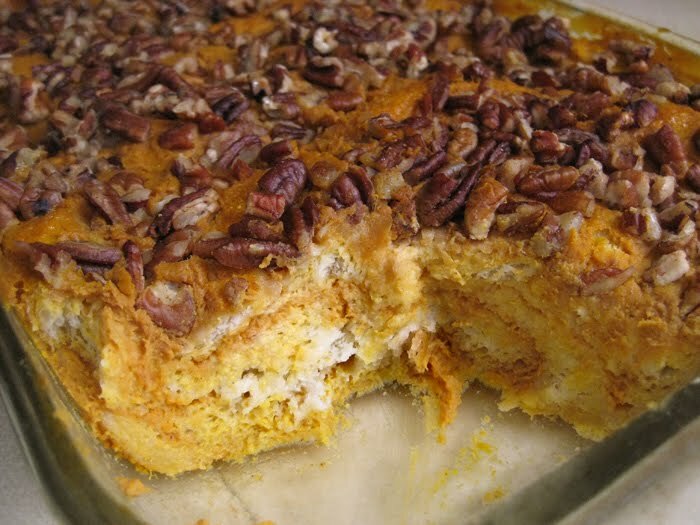 Tired of traditional pumpkin pie or looking to shake things up this Thanksgiving? Then I have just the recipe for you. Best part is you could practically make it with your eyes closed, though I wouldn’t necessarily recommend it. I’m just sayin’, it’s really easy! My mom described it as ‘orgasmic’, so I guess that means it’s also pretty darn tasty, and I’ll second that. *When it comes to bread just about any will work and you want it to be a little stale, so whatever kind you use, let it sit out uncovered for about a day. I first tried this recipe with sourdough, then with whole wheat and italian, and all three were delicious. A brioche or french would also work nicely or you can get extra fancy by using croissants or cinnamon raisin bread. You shouldn’t need more than 10 oz of bread, maybe less depending on what kind and the shape you use, you’ll just want to fill your pan nicely. You can either use 1/2″ slices as shown on the left (quick and easy!) or you can cut or tear 1″ cubes from an unsliced loaf and scatter them in your pan. When you’re ready to make the dish, preheat the oven to 350° and place the bread in a buttered 2qt baking dish. To make the custard, whisk all the wet ingredients and spices together in a large bowl then pour the custard over the bread in the baking dish. Be sure to stir it around or lift the slices to spread it in between and under, making sure all the bread is thoroughly coated. 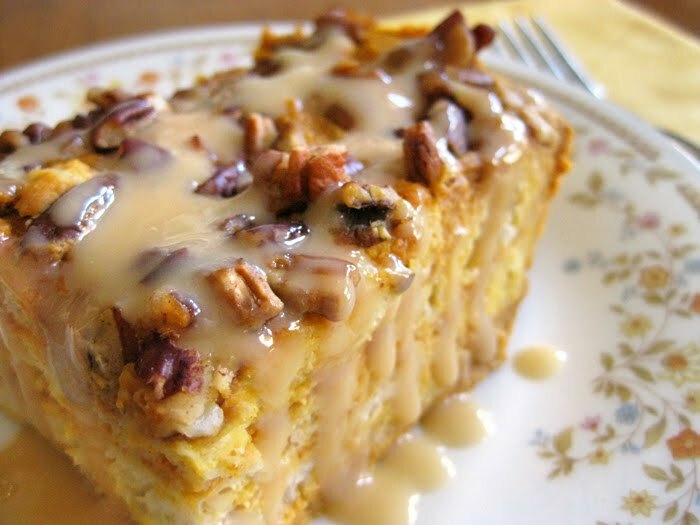 **If you’re not planning on serving this dish with any kind of sweet sauce, I recommend doubling the light brown sugar in the custard to 1/2 cup total. 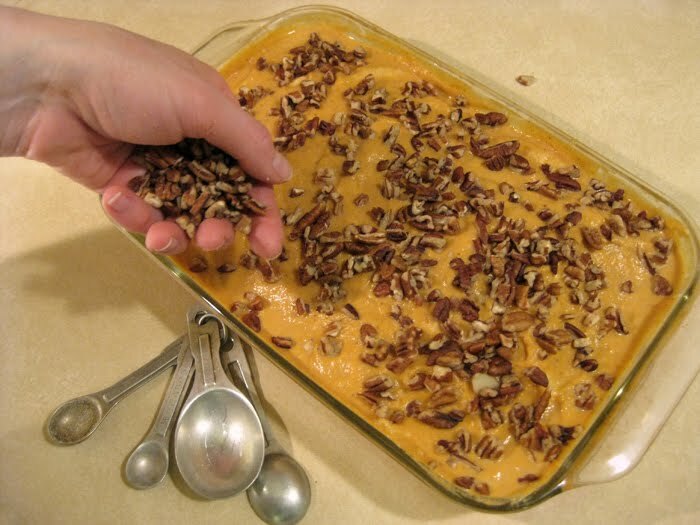 Next, toss the pecans in a bowl or plastic bag with 1 Tbsp brown sugar and 1/2 tsp cinnamon then spread them evenly over the pudding, if desired. Bake until set, about 40 – 45 minutes. You’ll need to cut into the middle to check the doneness as the top will set faster. In the meantime you can make the sauce. In a large saucepan, whisk together the milk, sugar and salt and heat to a simmer over medium heat. When it begins to bubble, remove from heat and stir in the baking soda. It will foam up a bit. Return to simmer and cook over medium heat, stirring occasionally and skimming off foam as needed. Sauce will begin to thicken and turn golden brown within 30 – 45 minutes. Continue cooking until sauce is thick enough to lightly coat a spoon. When the sauce is almost finished, add the Bourbon if desired, and continue cooking until it reaches the desired consistency. 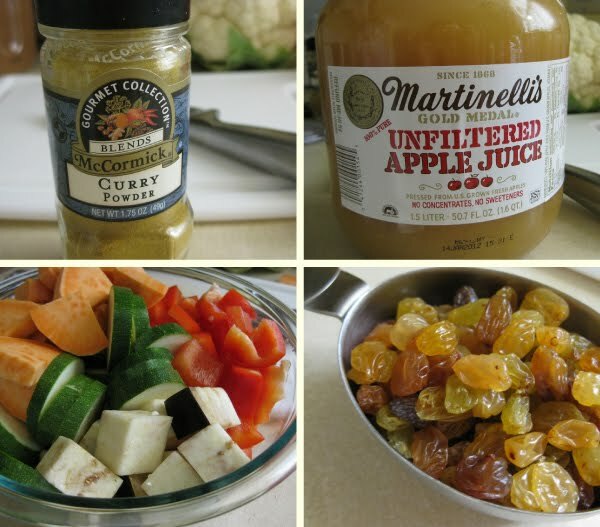 If you’re concerned about liking the flavor, start by adding one Tablespoon, then add the second if desired. Serve scoops or slices of warm pudding topped with warm sauce and enjoy! The pudding and sauce can both be stored, covered, in the fridge for up to two weeks and you can definitely make this ahead of time for Thanksgiving dinner. Just reheat it in a low stove or microwave before serving and fill your gravy boat with the warm caramel sauce! I’d love to hear what you think about this one and if it graces your dinner table this Thanksgiving. p.s. It’s also really good for breakfast! 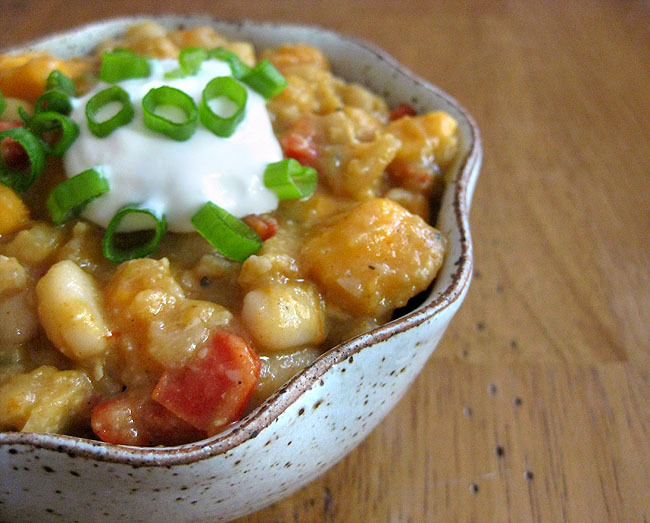 This is my healthy, vegetarian spin on a classic crowd pleaser. 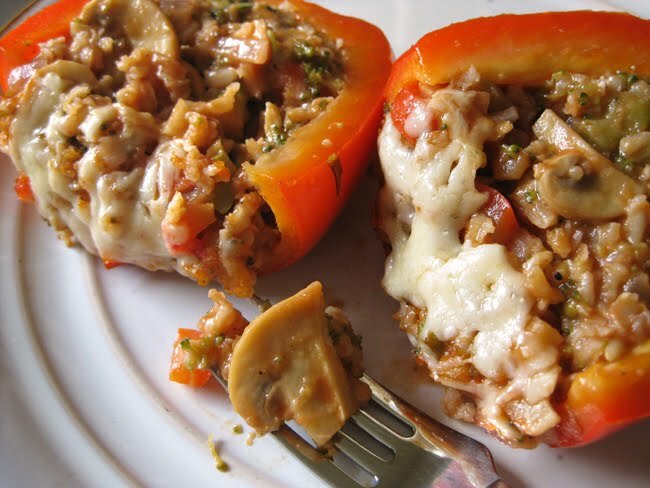 Made with brown rice, fresh veggies and a little cheese, you’ve got just about all your food groups stuffed into one yummy little package, or should I say pepper. This dish is easy to make and can even be whipped up the night before and then popped into the oven to bake when you get home from work. You’ll find a printable recipe card at the end of this post. Preheat oven to 375°. Slice the tops off your peppers and clean out any seeds and membrane from inside. If desired, you can chop up the pepper top (discarding the stem) and add it to your stuffing mixture. Brush the outside of the peppers with a little olive oil and set aside. Depending on what type of brown rice you are using, you’ll want to cook this ahead of time. I use Minute brown rice, which is easy and works well, so I start cooking it when I start making the filling, as it only takes about 5 minutes. To prepare the filling, saute the minced garlic and red onion with a little olive oil over medium high in a large skillet until tender. Add the mushrooms, broccoli and chopped pepper tops (if desired). Once the veggies are almost cooked through and soft, reduce the heat to medium, add the rice, chicken broth, salt and pepper and simmer until most of the broth cooks away and is absorbed into the mixture. Remove from heat and stir in the tomato sauce and parmesan cheese until thoroughly mixed and melted. I recommend tasting the filling at this point before you stuff the peppers in case you want to add any additional salt or seasonings. Spoon the filling into the peppers, stuffing them tightly. I cook mine in a glass loaf pan so if they want to tip over they don’t have far to go, but any glass baking dish will do and you can always stabilize them with some foil around the bases. 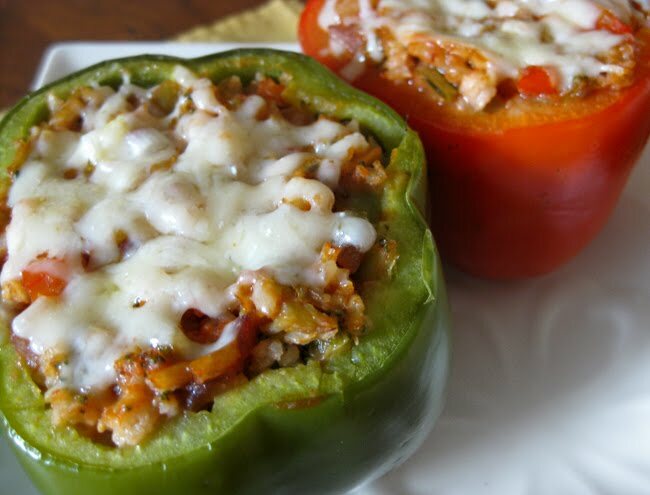 Cover the dish with foil and bake for 40 – 45 minutes until the peppers start to get soft. I like my peppers slightly al dente, so to say, but you can cook them a bit longer if you’d like them really soft. Remove the foil and sprinkle a little shredded parmesan on the top of the peppers, return to the oven and bake or broil until melted. Serve and enjoy! Don’t like parmesan? Try cheddar. Don’t like mushrooms or broccoli? 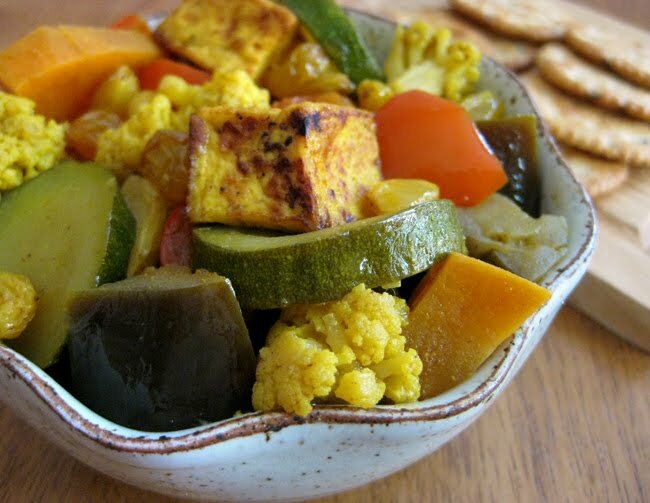 This recipe is very versatile and you can substitute just about any veggies or cheese you wish. For a mexican spin, try using black beans and chopped roasted poblanos instead of the mushrooms and broccoli along with pepper jack cheese. You can easily double this recipe to serve four or make it as is and stuff four small peppers instead of two. They also reheat well in the microwave or oven for a hearty lunch or second dinner. Enjoy! Yep, I said tofu again. 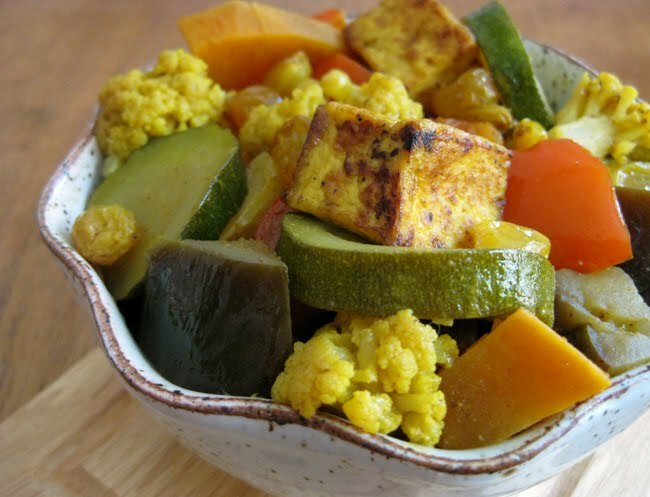 But this time we’re frying it up into crisp little cubes of yumminess then mixing it with a heaping helping of curry and a plethora of robust vegetables. 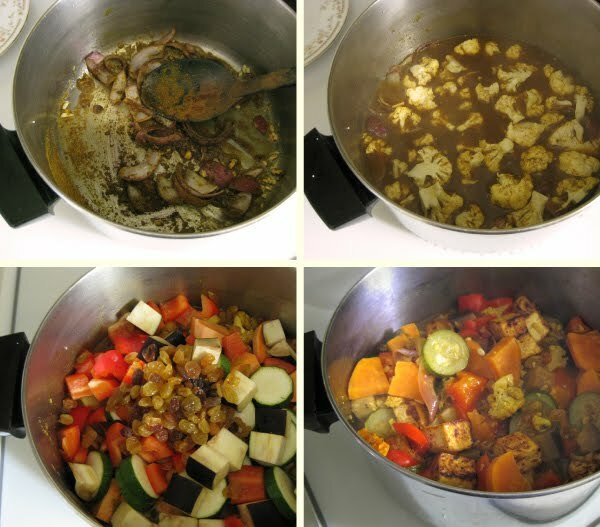 This colorful concoction can be made sweet or savory by using apple juice or broth and makes a hearty main entree when served over brown rice, cous-cous or quinoa. Any leftovers make a perfect portable lunch as this dish tastes just as good at room temperature or reheated in the microwave. The first step is to press, cube and pan fry the tofu. 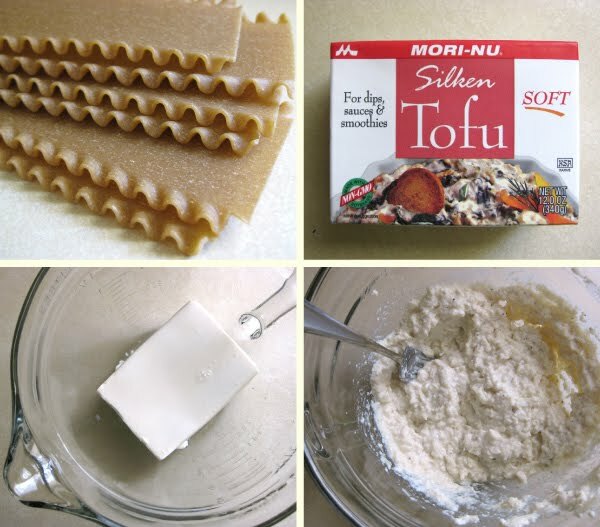 To press the tofu, halve the cake horizontally and set the two slabs on several layers of paper towels on a plate or cutting board. Top with additional paper towels and another plate or cutting board then weigh down with a heavy skillet or stock of books and let sit for about 20 minutes. 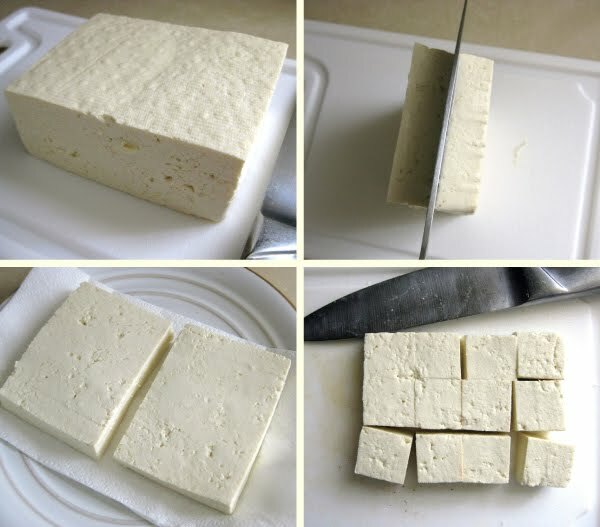 Once pressed, cut the tofu into 1″ cubes. Coat a large skillet with cooking spray and fry the tofu on medium high heat until crisp and browned on all sides, about 2 – 5 minutes per side. Set aside. While the tofu is pressing and cooking you can prep the other ingredients. You’ll start by cooking the onions and garlic, then add the cauliflower and carrots, so keep them separate. You can place the rest of the vegetables in a large bowl as you cut them, they will be added all at once. Heat about one Tbsp of canola oil in a large pot or dutch oven. Add the garlic and red onion and saute until slightly softened. Add the curry and cinnamon (and turmeric if making it savory) and cook until fragrant, about 1 minute. Add the liquid (apple juice or broth), the cauliflower and the carrots. Bring to a boil then reduce heat, cover and simmer for 10 minutes. Next add the tofu, remaining vegetables, raisins, salt and pepper. Cover and simmer about 20 – 25 minutes, until the vegetables are tender but still hold their shape. Add additional seasonings to taste. You may find you like more salt than I call for, as I try to keep the salt fairly low in most of my dishes. This dish is delicious served alone or atop a healthy grain like brown rice, cous cous or quinoa. Don’t like tofu? Just leave it out or add some chicken. You can also adjust the vegetables to suit your tastes but I find this combination hearty and delicious any time of year. Enjoy! When asked what my favorite dessert is, I’ve never really had a definite answer – until I made these. See, me and peanut butter have this ‘special’ relationship that I just can’t describe. I’m sure some of you understand. And my guess is you’re either licking your computer screen right now or gagging at the thought of it, because peanut butter kinda seems like one of those things you either love or hate. 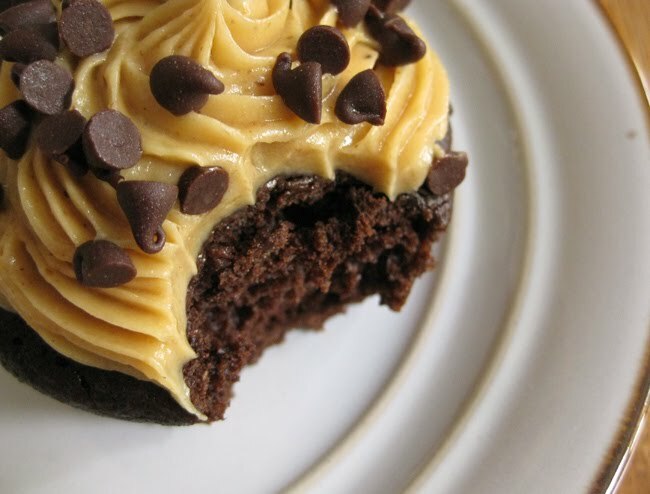 Understanding that everyone’s tastes are different, I’ll simply say it’s my opinion that you won’t find a more perfect chocolate cake or peanut butter frosting than this. Don’t love peanut butter? Don’t worry — these cupcakes are the perfect base for topping with anything your heart desires. Insanely moist, dark and rich, no one will ever know they are made with whole wheat flour and are low in sugar compared to many. Don’t worry, I won’t tell your other recipes you have a new favorite. *If you find you like a sweeter cupcake, increase the sugar to 1/2 cup. Sweeter still? Also increase the brown sugar to 1/2 cup. Preheat the oven to 350° and line a 12 tin muffin pan with paper liners or grease and lightly flour cups. 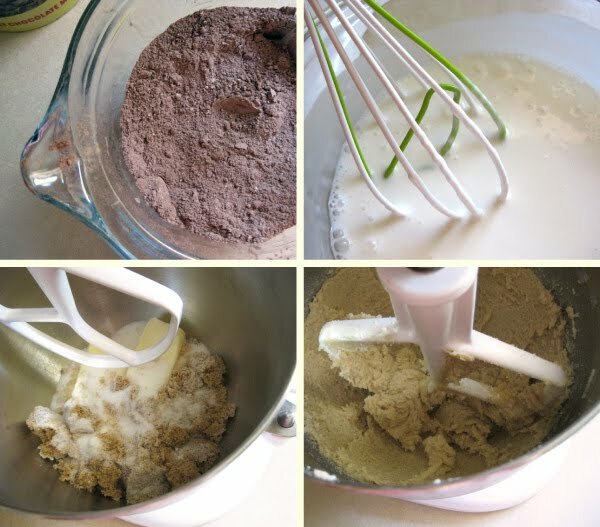 In a medium bowl, sift together the flour, cocoa powders, baking soda and salt. Set aside. In another bowl or measuring cup, whisk together the buttermilk and sour cream, set aside. With an electric mixer (hand or stand) in a large bowl, cream together the butter and sugars until light and slightly fluffy. Add the eggs, one at a time, followed by the vanilla and mix until well blended. Next add the buttermilk and the flour mixtures, alternating one third of each at a time starting with the buttermilk and ending with the flour, beating on low speed. Mix just until blended. Divide the batter evenly among 12 prepared cups and bake at 325° for 17 – 20 minutes until a toothpick inserted in the center comes out mostly clean. Cool for about 15 minutes in the pan then transfer to a wire rack and cool completely before frosting. 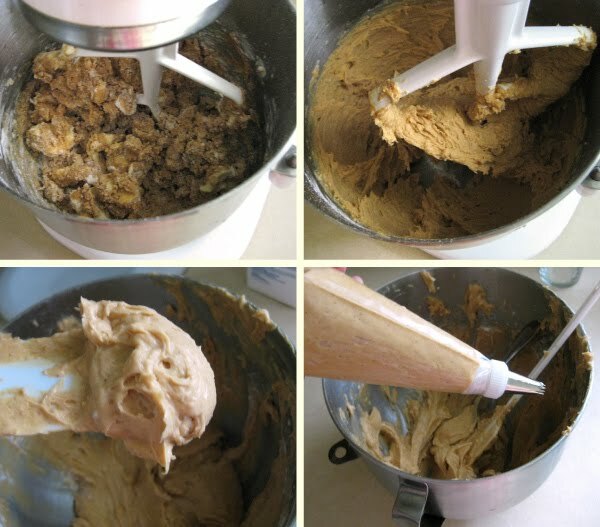 To make the frosting, place all ingredients in a large bowl and beat first on low speed, then on medium high until smooth and creamy. Scrape down the sides of the bowl as needed. Do note that I use natural peanut butter for this recipe, meaning nothing in the jar but peanuts. No sugar, no salt, no additives of any kind. 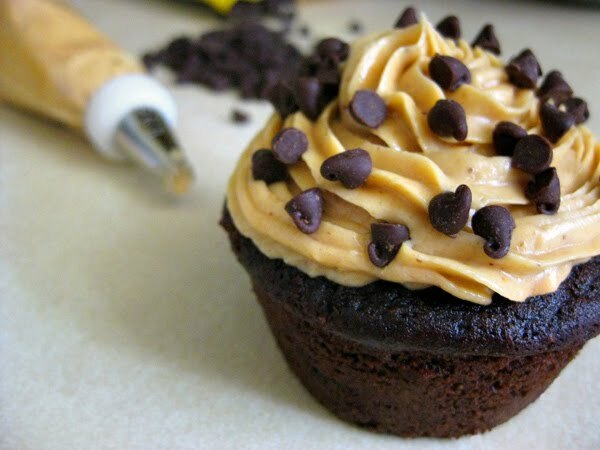 You certainly can use a brand like Jif but it will make a much sweeter and intense frosting, and I don’t recommend it. I use a pastry bag to pipe on the frosting, and if you do so, you can chill the frosting in the fridge a bit to make it easier to work with. Alternatively, you can simply spread it on with a butter or frosting knife right after making it. Just be sure your cupcakes are completely cooled or the frosting will melt right off. 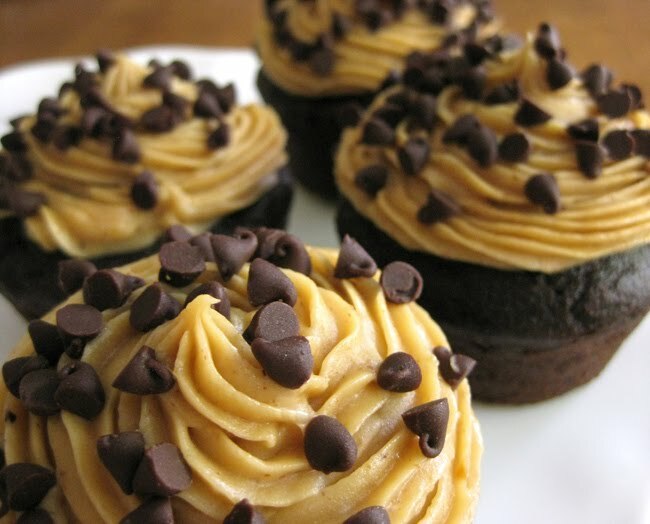 If you wanna go all out, top these babies with some mini chocolate chips or chocolate shavings after frosting. If you aren’t serving these right away or if you have any leftovers (fat chance), store them in an airtight container the fridge but allow them to warm back to room temperature before serving. So now that I’ve hyped these up so much, I hope you aren’t let down, and I’d love to hear what you think. Enjoy! I know, I said tofu, but don’t be scared. If you’re one of those people whose gag reflex is induced at the sheer sound of the word, give me a chance to change that. In this recipe, the tofu is a healthier alternative to what would normally be ricotta cheese, which I’ve never been too fond of (except in pancakes, but that’s another post…) and trust me, no one will ever know the difference. 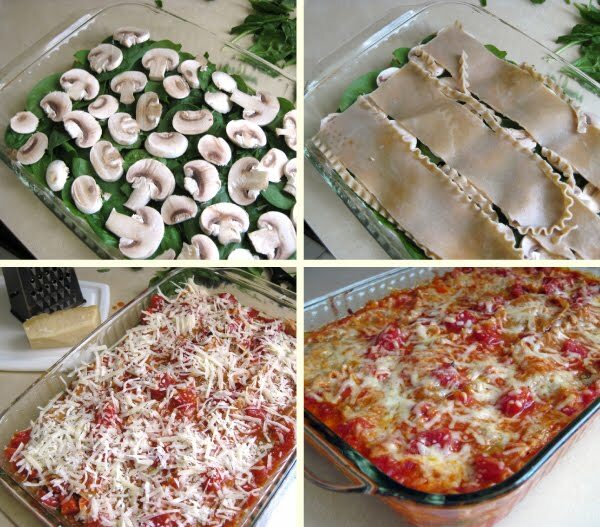 And while you can certainly call this lasagna homemade, the use of a few convenience products make this dish a breeze to whip up any night of the week. Want to beef it up for the carnivores in your life? Add some cooked chicken or sliced sausage before baking. 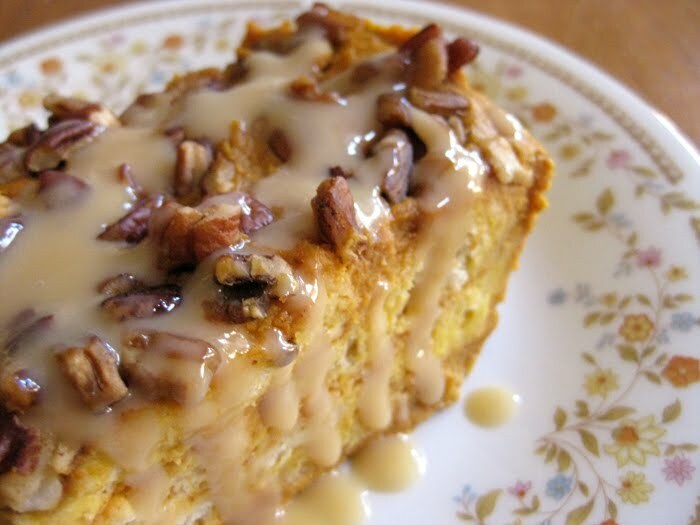 Read on for the recipe and find a printable recipe card at the end of this post. 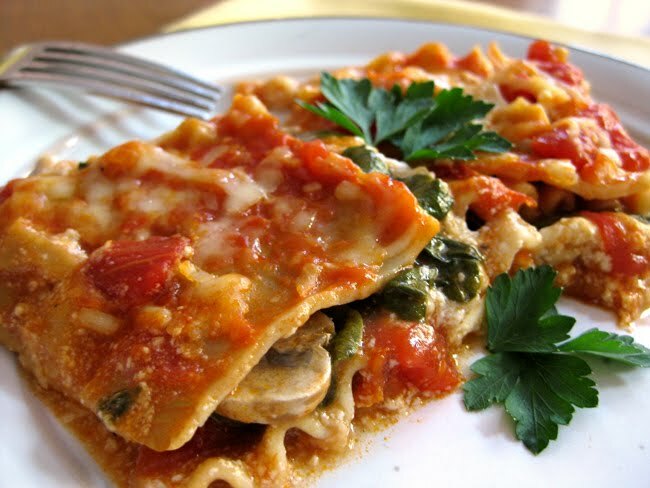 *You can use regular or no cook (oven ready) lasagna noodles. I use whole wheat noodles that need to be boiled before using because I can’t find oven ready wheat ones. If you use no cook noodles, just take them right from the box to the pan and skip the boiling. Preheat the oven to 350° and a coat a 13″ x 9″ baking pan with cooking spray. If using noodles that need to be boiled, get those started while you prepare the filling and sauce. They usually need to boil for about ten minutes. To prepare the sauce, heat the olive oil over medium high heat in a medium saucepan and saute the minced garlic until fragrant, about 2 minutes or so. Add the can of diced tomatoes with their juice and cook until they are about half broken down. Add the cans of tomato soup and tomato paste, reduce the heat and simmer for about 5 minutes. In the meantime you can prepare the filling. In a medium mixing bowl, use a fork to combine the tofu, 1 cup of the mozzarella, lemon juice, salt and pepper until it is broken up and well blended. 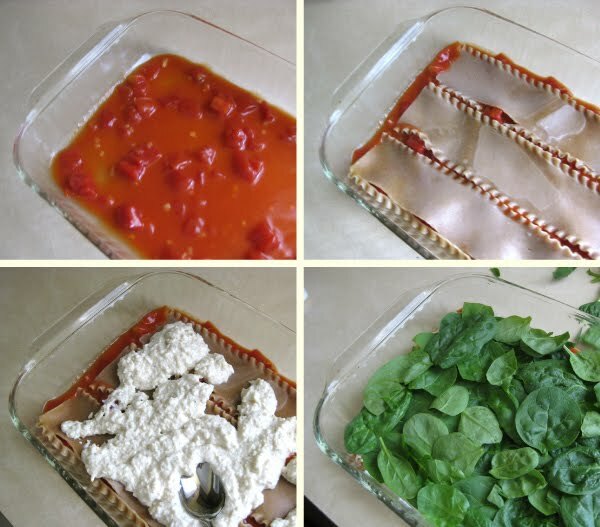 To assemble the lasagna, spread about 1 cup of sauce in the bottom of the prepared baking dish. Lay three sheets of pasta in the dish, leaving a bit of space around each one. Spread the tofu mixture evenly over the noodles then top with a layer of spinach and a layer of mushrooms. Place the three remaining sheets of pasta on top of the vegetables, followed by the remaining sauce, 1/4 cup mozzarella and the 1/2 cup parmesan. Cover with foil and bake for about 35 minutes until heated through and bubbly. Remove the foil and bake another 5 – 10 minutes until the cheese starts to brown and bubble. Let stand about 10 minutes before cutting and serving. I made this dish fairly light on the cheese, which I prefer. It leaves you feeling full and satisfied without that weighed down feeling. 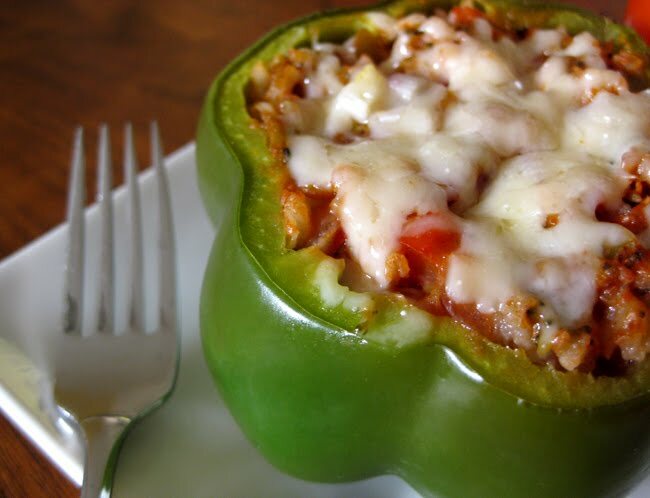 You can, however, add a layer of cheese inside on top of the veggies or add more to the top if that’s how you like it! 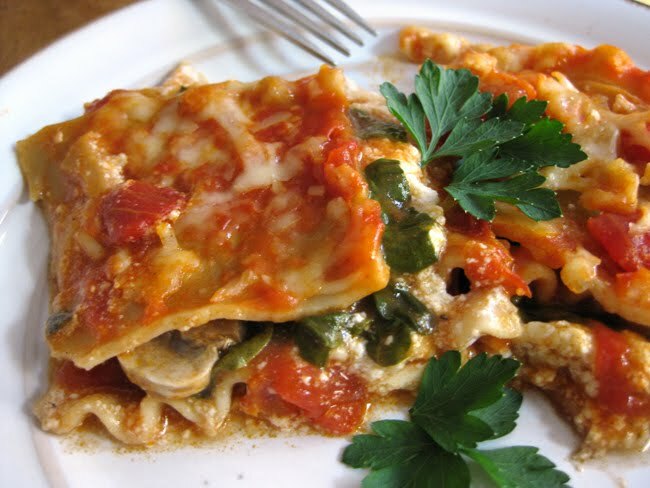 It’s also a thin lasagna, but makes a good amount to serve about 5 – 6 (depending on your appetite :). If you’d like a bigger batch, simply double the filling, add an extra can of diced tomatoes to the sauce, cook an additional three sheets of pasta and add an extra layer. Also as I mentioned in the beginning of the post, try adding some cooked chicken or sliced sausage before baking for the meat eaters in your household. Hope you enjoy! I’d love to hear what you think of the tofu. I have a goal. That goal is to share recipes at a time when it makes sense to share them. For example, strawberry recipes when strawberries are ready for picking, and so on. This, however, doesn’t always work out due to my lack of planning, or in this case, my lack of patience. I first made these muffins back in March when the maple syrup was flowing in Pancake Town, USA, and while I missed the boat on sharing them then, I knew I couldn’t wait an entire year and figured they’d be perfect for the Fall. This is where my impatience comes in, as you can see it’s August and here they are. Close enough, right? *You can also sub 2 cups whole wheat pastry flour or 2 cups all-purpose flour in place of the flours specified. Preheat the oven to 375°. 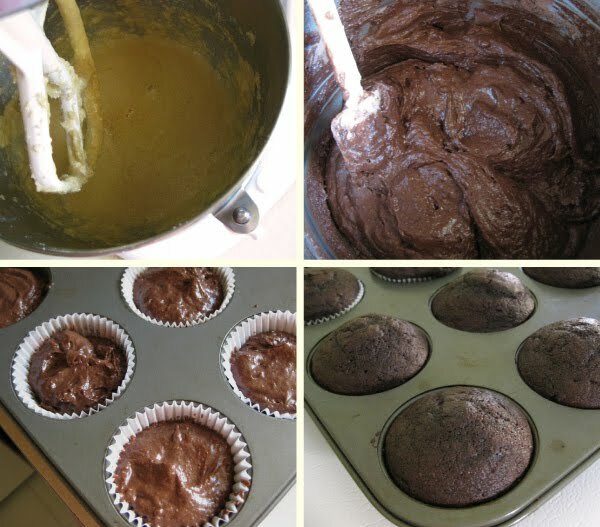 Line 12 muffin cups with paper liners or grease and flour. Beat the butter and sugar together until light and fluffy. Stir in the ground almonds then slowly beat in the eggs. Next stir in the chopped pecans. Sift the flour, baking powder, baking soda and salt into the butter mixture. 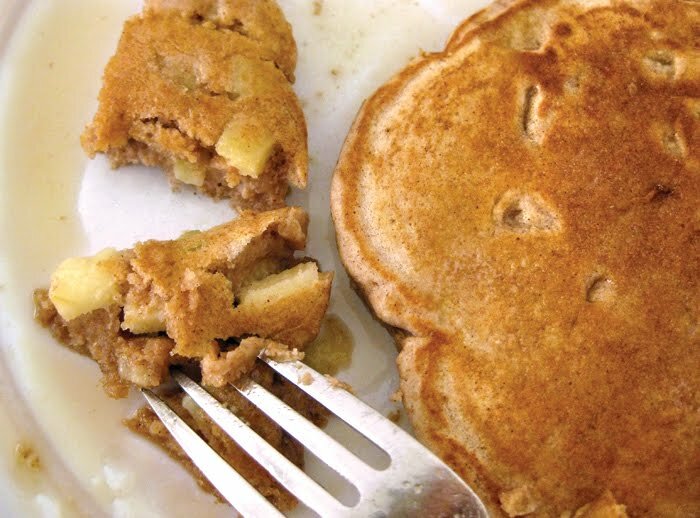 In a small bowl, blend the buttermilk with 6 tablespoons of the maple syrup. 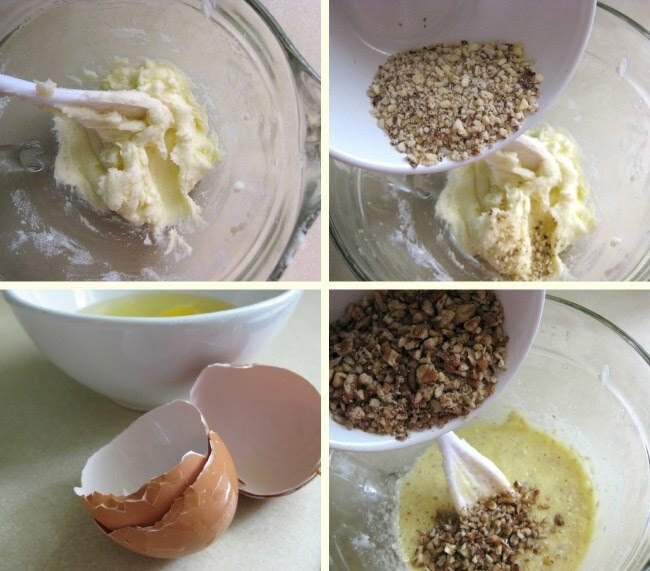 Pour it into the butter and flour mixture and blend gently until just combined, be sure to not overmix or your muffins will be tough. Divide the batter into prepared cups, filling about 2/3 full. 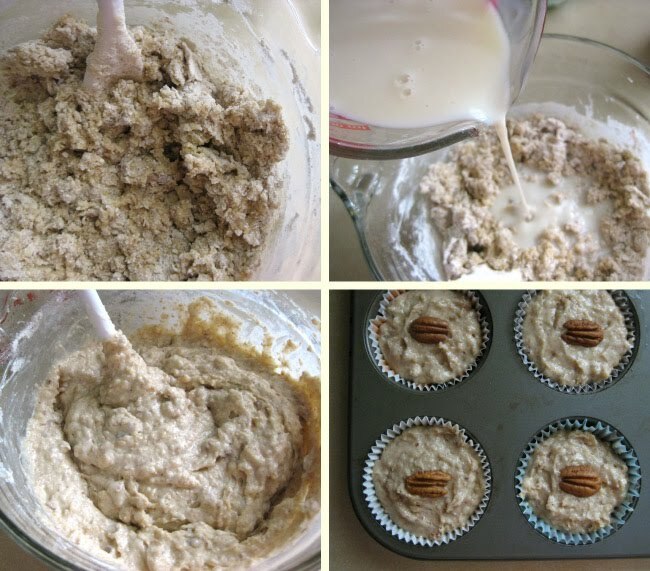 These muffins will rise quite a bit, so be sure not to overfill. 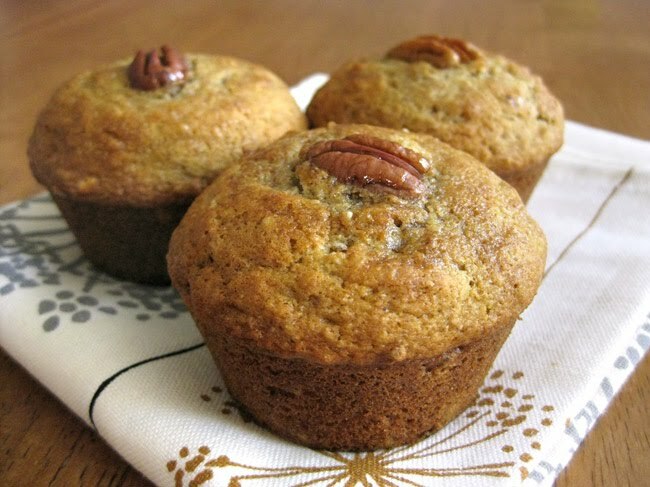 Top each muffin with a pecan half and bake for 20 minutes, or until risen and firm to the touch. Cool in the pan for about 5 minutes then transfer to a wire rack. 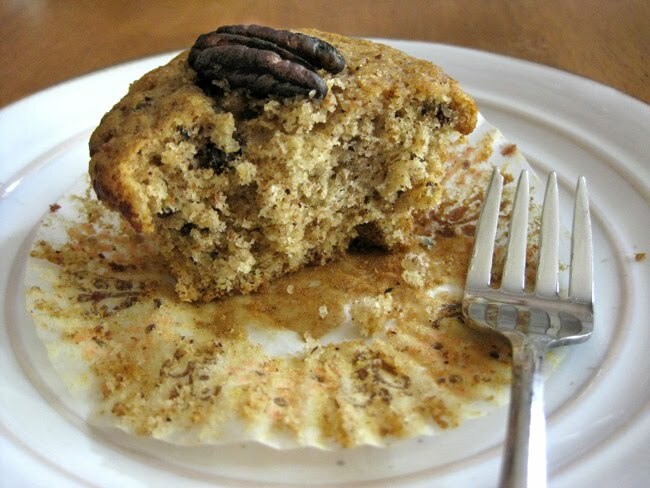 Brush the remaining 3 tablespoons of maple syrup on top of the hot muffins until it is all gone.